Dewitt & Lane prides itself on providing comprehensive consulting services through its audit. Our services are not only about finding you unclaimed monies. 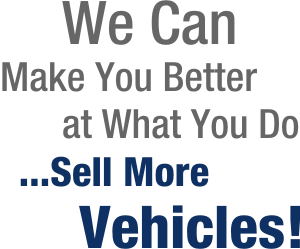 It is our desire to help the dealership to identify trends and issues that have led to such unclaimed incentives. The consulting documentation provided with the no strings service explicitly shows the trends of the unclaimed incentives and serves as an educational tool to each dealership and its staff. Dewitt& Lane’s services not only help you identify monies from past sales, but will undoubtedly help increase future sales and retrieval of future incentives. Failing to identify such incentives on the front-end directly impacts on new automobile sales and leases. If sales managers and salespeople are aware of all incentives up-front, it gives a true and accurate picture of the options available to further convince the prospective car buyer of the value of buying that particular new vehicle from that particular dealer.